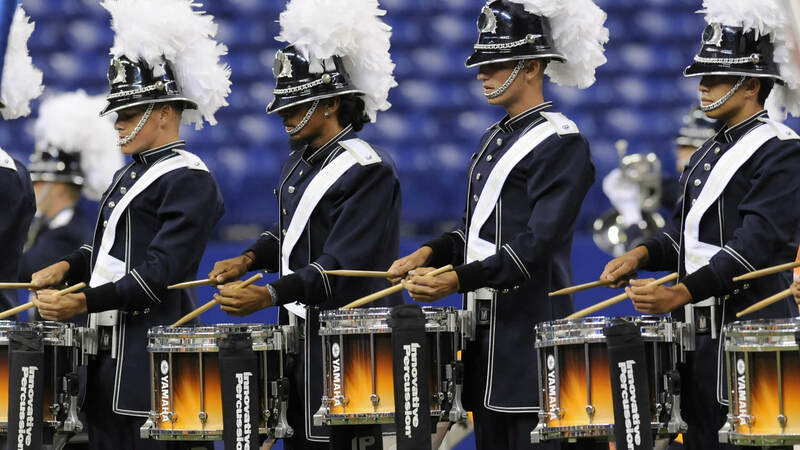 The 2014 Drum Corps International World Championship is remembered for the Blue Devils finishing the season undefeated. In the process, the corps broke a nearly decade old scoring record, ending just 0.350 from a perfect score. The Devils took first in every caption except Percussion, which the corps lost to Santa Clara Vanguard by only 0.15 of a point. Bluecoats finished with the corps’ highest placement ever, passing up the Cadets, who had been second in both Prelims and Semifinals. 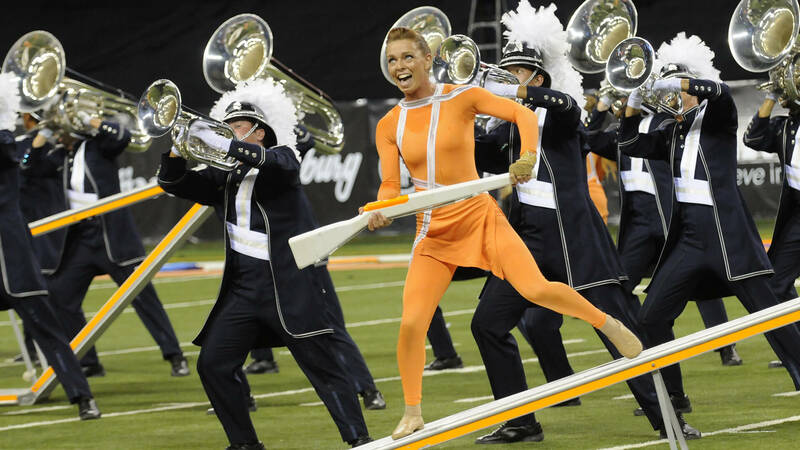 Bluecoats’ “Tilt” was performed on a field that was tilted to the side, bordered by an off-kilter perimeter comprised of orange runners. The drill was oriented to the tilt of the runners, meaning lines and blocks were often not parallel to the field’s yard lines. 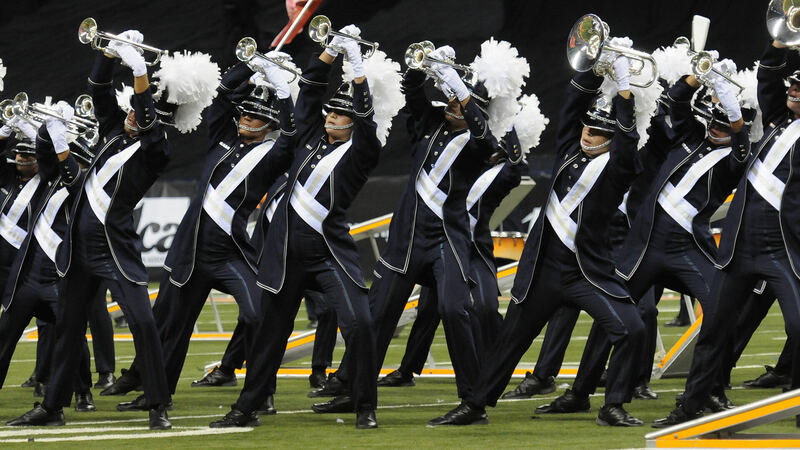 Carrying the theme through the entire show, the corps’ pre-recorded introduction was audibly “tilted,” as were the sash cummerbunds on the uniforms, and even the drum major stand. Eighteen obtuse scalene triangle ramps, painted white on one side and orange on the other, were continuously maneuvered around the field, constantly changing the visual texture. The corps played two selections by Tyondai Braxton, an experimental music performer and singer whom some have compared to Frank Zappa. Braxton is a former guitarist, keyboardist, and vocalist for the American prog-rock band Battles, which he co-founded in 2002. He also once played in a trio with Chick Corea and is the son of composer and free jazz woodwind artist Anthony Braxton. Intrigued by the drum corps activity, and wondering why a corps would be interested in playing his music, Braxton requested recordings of the corps throughout the season in order to follow the Bluecoats’ process. “It's a surreal experience knowing that the source music composers are listening to the corps,” Westman said. “Tilt” opened with Braxton’s “Uffe’s Woodshop,” from the 2009 solo album, “Central Market.” In its original form, the piece included six guitars, kazoos, strings, and various synthesizers, much of those parts performed by the Wordless Music Orchestra, a New York assemblage of experimental musicians. Snare drummers started on the ramps, tilted backward by color guard members attired in the same orange color as the perimeter of the field. Brass players also leaned against and reclined on the ramps during the piece. The next selection was “to wALK Or run in wEst harlem” by Andy Akiho, a percussionist and composer of contemporary classical music. The piece was written in 2008 for the Bang on a Can All-Stars, an ensemble of six performers that blurs the distinction between classical, jazz, rock, world, and experimental music. The original work included a prepared vibraphone, its individual bars altered by the addition of assorted miscellaneous items that changed each bar’s sound. Snare drummers performed one-handed rolls, with alternate drummers playing the alternating strokes. That was followed by tenor drummers playing atop the hypotenuses of the ramps as the triangles were balanced precariously on the vertices of the bottom points, then rocked to both sides opposite the hypotenuses. That visual required the drummers to continually shift their weight to stay upright. To top that off, the snare drummers played while leaning back against guard members, then continued to play while leaning forward, the guard members hanging onto their uniforms in a maneuver that required total trust. One of the most effective ballads to hit the drum corps field was Taiwanese-American pianist and singer Vienna Teng’s entrancingly ethereal “The Hymn of Acxiom,” from her 2013 album, “Aims.” Throughout, the color guard members handled L-shaped tubes that appeared as incomplete triangles. The show’s closer was Braxton’s “Platinum Rows,” also from his “Central Market” album. Braxton says that his influence for the piece included Stravinsky and Brian Eno, the experimental English musician who coined the term, “ambient music,” which is a sort of calming background mood music mostly devoid of melody. Braxton’s work featured dizzying strings and an enthusiastic use of kazoos and explosive guitars. Consider what the music Stravinsky might sound like if the composer were alive today with access to digital technology. Tubas standing on the ramps played four-part harmony, a most unusual effect. Then came the moment for which everyone in the stands anticapted; the corps’ monstrously popular pitch bend effect. As the horn players got on their knees and leaned back to play a loud chord, they conspicuously removed their horns from their faces and let a synthesizer take over. The horn players bent over further as the synth effect slid ever lower in pitch. Kneeling upright, the horn players went back into playing position for the next chord, then lifted the horns above their heads as the pitch bend rose higher. The reason the synthesized sounds were so effective was due to the sound originating with the corps itself. The brass section recorded the chords early in the season, which were then sampled and played back in mutated form by the synthesizer—in effect creating a virtual horn line. At the very end, a horn player set down his instrument, vigorously ran across 20 yards, continued up one of the ramps at full speed and threw himself high off the ramp into the waiting arms of several color guard members, the entire group collapsing to the ground with all energy expended. For this week only, you can save on the DVD or Blu-ray set that contains this complete Bluecoats performance, along with all finalists from the 2014 DCI World Championship. Buy the 2014 World Championship Blu-ray set. Buy the 2014 World Championship DVD set.